Precision Industries generating sets are designed and manufactured in our facilities which certified to ISO 9001:2008 standards with fully integrated power generation system providing optimum performance, reliability for Prime and Standby applications. Diesel Generating set designed and manufactured to comply with ISO 8528-1 to 12, Diesel Engine performance according to ISO 3046, BS 5514, DIN 6271, Generator (Alternator) performance according to NEMA-MG1, BS 5000, DIN EN, relevant ISO, IEC60034, Generator Circuit Breaker design comply with IEC – 60947-2. 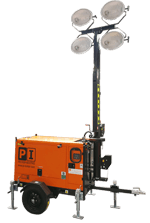 PI Tower Light is Designed for working in ruler Area with High withstand capacity of Tower Light Mast and can provide illumination to far area required for construction work. 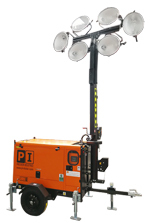 PI Tower Light is available with easy towable design. Genset is switchable to both frequency standards (50/60Hz). 110 kph of Wind Speed. Learn more about our work and the team that makes it possible. Articles, research and information about forthcoming events. Need a help, more information or have a comment. Copyright © 2017 Precision Industries. All rights reserved.